The U.S. Army’s principal research and development center for chemical and biological defense technology, Edgewood Chemical Biological Center (ECBC), this month welcomed Col. Thomas Saltysiak as its new military deputy to the director. Saltysiak was previously assigned to as a product manager for Battlespace Management Integration (BMI) under the Integrated Air and Missile Defense (IAMD) Project Office at Redstone Arsenal in Alabama. 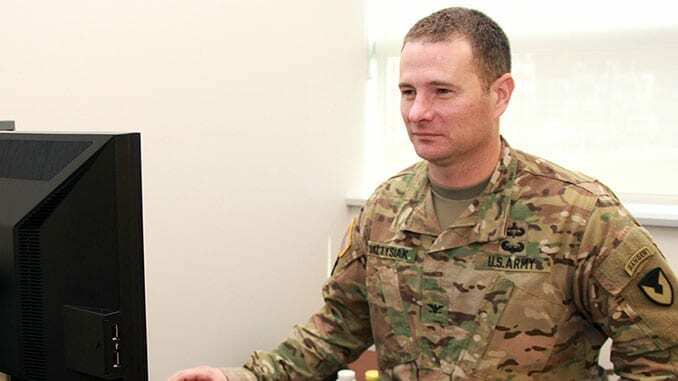 A Baltimore native, Saltysiak arrived at Edgewood on Oct. 3 from a six-month deployment to Afghanistan and Kuwait, in which he served as director of the office of the Assistant Secretary of the Army (Acquisition, Logistics and Technology), Forward, CENTCOM. He describes his new role as “fairly different” than his previous positions. “In Kuwait and Afghanistan, I was there as a forward representative in the theater for the Assistant Secretary of the Army, Acquisitions, Logistics and Technology, who leads all technology efforts for the Army, including RDECOM and ECBC.” In looking for his next assignment, he requested a move to RDECOM, which would give him an opportunity to work on the science and technology side of acquisition. Saltysiak is looking forward to collaborating on systems engineering approaches such as model-based systems engineering and system architecture analysis, as well as helping the leadership with technical challenges of project management such as schedule risk simulation. Saltysiak will report to ECBC Director Joseph Corriveau, Ph.D. He succeeds Col. Debra Daniels, who retired in August.